In Zhangjiajie, Hunan Province, the Wulingyuan Scenic Area covers an area of 264 square kilometers and includes Zhangjiajie National Forest Park, Suoxi Valley and Tianzi Mountain. It has 3,103 spectacular peaks, which produce a fantastic view. It also has many valleys, streams and remote forests. Some 85 percent of its area is covered by forests and 99 percent by plants. There are about 3,000 kinds of plants including 700 kinds of trees and 450 kinds of flowers. There are also 116 species of terrestrial vertebrates from 50 families. In addition, there are underground karst caves. The Yellow Dragon cave is 11 kilometers long. 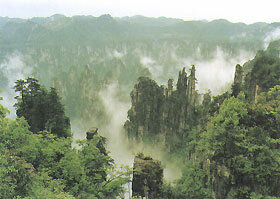 Wulingymam is famous for five wonders-spectacular peaks, fantastic rocks, quiet valleys, beautiful pools and karst caves.